Cooking and eating together for people over 50. Please see our Courses page for further details. Come and help look after the animals and gardens. For parents/carers and under 5's, have fun outdoors with your children with a relaxed, friendly group. 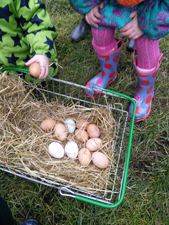 Farm Tots is drop-in and runs all year round. Please call or look at our Facebook page to check it is running, due to bad weather etc. £2.50 or £2.00 if you are a member (includes drink and snack). Improve your health and meet new people by joining our free, friendly, weekly walking group. Our walks are aimed at people wanting to improve their physical and mental health through gentle walk exercise. They take place on the farm and surrounding green space and are between 30 - 60mins depending on walker's needs. We end the walk with tea/coffee and some time to chat in the farm's Community Room.Please arrive at 1.45pm if it is your first time to fill out a registration form. (walk starts at 2pm). For any further information or to discuss any access needs, or if you would like to volunteer on the walks pleaes contact kerry@lwfarm.org.uk or 0117 9381128. Interested in getting involved in gardening on the farm? Come along Fridays to help with our gardens. Call Ian 0117 9381128 for more details. Please see our Volunteering page.